Ryogoku Station is right beside Sumo Hall where the Professional Sumo bouts are held. Another big reason for coming to Ryogoku is the gigantic Tokyo Edo Museum also right next to the station. Nearby there is also Yokoamicho Park with a nice Memorial Building, the ultra modern looking Sumida Hokusai Museum, the Japanese Sword Museum, and the Kyuyasuda Gardens. See below for a list of things to do while visiting Ryogoku! 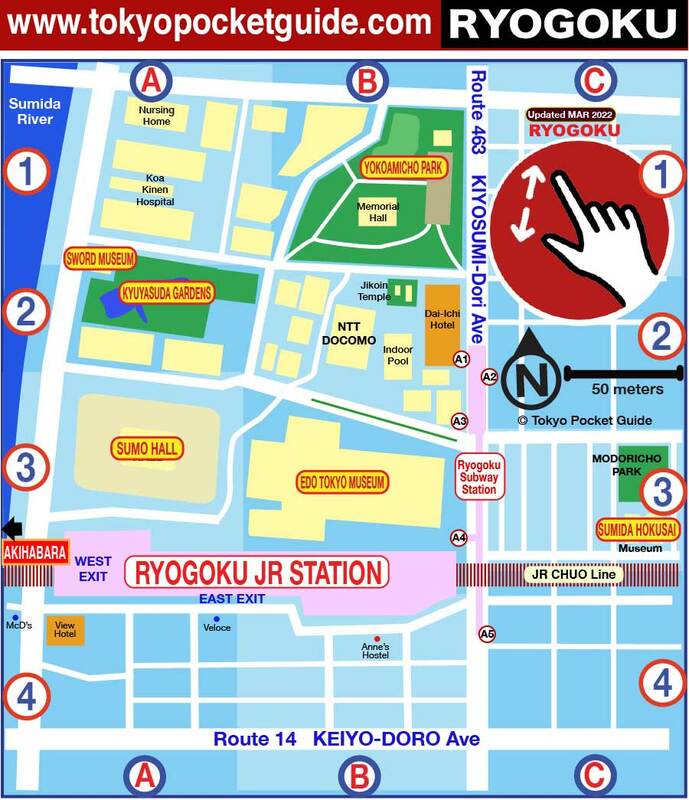 CLICK MAP TAB on right for high-res printable map of Ryogoku (PDF)! Sumo Hall is where the Professional Sumo Tournaments are held in Tokyo. There are three tournaments held every year - the New Year Tournament in January, the Spring Tournament in May, and the Fall Tournament in September. The other three tournament are held in Osaka in March, in Nagoya in August, and Fukuoka in November. 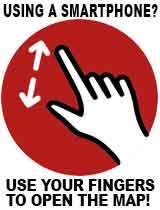 For information about buying Sumo tickets online click the below tab. The Sumida Hokusai Museum is dedicated to showing the works of Katsushika Hokusai, an edo period artist whose works gained worldwide fame. The museum is split into several areas including a lecture room, a library, a permanent exhibition space and a room for special exhibitions. THe Edo Tokyo Museum has goods and setting from the Edo period (1603-1868) when Japan was pretty much all by itself and the culture of Japan developed and flourished. There are life size street scenes and information on all the various things that bloomed during this time in Japanese History. This traditional garden area was made by Japan's 5th shogun in the 1700's and feature pathways through flower gardens, lawns and a small lake. Generally open between 9am and 6pm. Learn all about Japanese swords at this pleasant museum located near the Kyuyasuda Gardens. The are exhibitions showing the various types of swords, the Japanese names of the different parts, and the history of swords in Japan. This wide park has a large hall topped with a pagoda that is dedicated to the large number of people who died in the park after the 1923 Great Kanto Earthquake. There is also a memorial hall to those who died in the bombing during WWII. Paths lead around an area of gardens and a childrens play area. Printable Sightseeing Map of Ryogoku area in English (PDF)!